Backstage Press: Back to Basics: Finally, a Punk-Rock Tour! Back to Basics: Finally, a Punk-Rock Tour! Hey Boston, are you sick of winter yet? Are you thinking this horrid weather is never going to end? Well, don't let it get you down. You've got a lot to look forward to, believe me. and Billy Talent. And they'll be playing the House of Blues, twice. 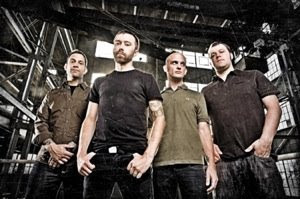 Rise Against have been touring non-stop since early last fall. They're currently bouncing around the U.K., and will soon be heading off to Australia to give their international fans a taste of their latest album, Appeal To Reason. They'll be back stateside in May for Bamboozle, and come June, Rise Against will be taking the states by storm again. Is this band really anything short of amazing? They've crafted their music, message and image on some basic ideals of equality, freedom and animal rights. Whether you agree with them or not, you've got to give them credit for standing up for what they believe in. Besides, their music transcends party lines. Democrat, Republican or Independent, I'm pretty sure anyone can feel something from songs like "Swing Life Away" or "Ready To Fall." Rise Against have an amazing talent to blend heartfelt emotion with political activism and a message. They're a working man's band. They've gotten to where they are because of their dedication and persistence. And boy am I thankful for that, because now I get to see one hell of a tour this summer. Now, let's not forget about the other awesome talent that will be joining the Chicago natives. Rancid are set to open for the entire tour. How cool is that? These guys are the fathers of modern punk-rock. They've been playing together since 1991, post Operation Ivy, of course. Think about it though, 1991. How old were you? Five or six? You definitely weren't sweating it out in the pit with Tim Armstrong. Neither was I for that matter, but it will still be awesome seeing the guys this summer. I wonder if Armstrong will still wear his leather jacket come late-July when they're in Boston. Hmm..
but for some odd reason they haven't caught on in the U.S.. Maybe this tour can change that. They've got some really catchy hooks, and a sound that's all their own. And isn't that what all of us indie kids are looking for these days anyway? So make sure you show up when the show starts. You won't want to miss their live performance. As for the tour itself, it's nameless as of now. I know, boring. But like I mentioned earlier, Boston is lucky enough to have two shows listed. July 28th and 29th at the House of Blues. How exciting, I know you all miss those late nights on Lansdowne Street. So is that enough to make you smile? Did you forget the fact that it's snowing outside for a hot second? I hope so. Be happy Boston, you've got a great summer coming up. Awesome tours, awesome music and warm weather. It doesn't get much better than that kids.